"Just because you are on your motorcycle, whizzing across the roads of the country doesn’t mean that you don’t have people to talk to and business to get done. Other times, when you’re zooming around on your hog, you may just want to listen to some tunes on your bike without the tangle of wires, or the pre-installed speaker on your bike being drowned out by the roar of the wind. 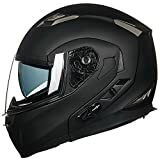 One of the best ways to ensure that you stay connected and entertained is to invest in a motorcycle bluetooth helmet speaker." Bluetooth 3.0 Technology. 8 Hours of Talk Time and 110 Hours of Standby. Fully Washable Microfiber Liner and Adjustable Vents. One Touch Control for Calling, Answering, Rejecting Incoming Calls and Redialing. Incoming Phone Call Overrides Intercom, Music, FM Radio and GPS Navigation Audio. Supports a Max distance of up to 1000 Feet Between Two Riders Using the Intercom. 2 High Quality Built-in Speakers with Full Stereo Sound. Just because you are on your motorcycle, whizzing across the roads of the country doesn’t mean that you don’t have people to talk to and business to get done. Other times, when you’re zooming around on your hog, you may just want to listen to some tunes on your bike without the tangle of wires, or the pre-installed speaker on your bike being drowned out by the roar of the wind. One of the best ways to ensure that you stay connected and entertained is to invest in a motorcycle bluetooth helmet speaker. With the technology that we have in 2017, there are some bluetooth headset speakers have sound quality that would blow your mind and that rival the best surround sound at any theater. They are often pretty cheap and come in a large variety of types. There are two main different types of speakers for you to consider. Each type has its own pros and cons and some might fit certain riders great while others find them to be simply unusable for their purposes. This buying guide is designed to help you pose and answer some of the questions when you’ve made the decision that you want to buy a speaker but aren’t quite sure what type you want yet. For starters, there is the type that comes built in to the helmet, which is an on ear headphone and are located, obviously, in the ear flap of the helmet itself. While the sound quality is great and the convenience of having a bluetooth connection is wonderful, these speakers are obviously only usable if you’re wearing your helmet, they cannot be removed from the helmet itself in any way. On the other hand, you can also buy freestanding motorcycle bluetooth helmet speakers. These speakers are placed inside of the helmet and can be removed and used if you are not wearing the helmet. They’re generally placed in the same area as the built-in one, obviously near the ear flaps, but can be adjusted to be more comfortable for the wearer. One potential downside of using these freestanding speakers is that they have the potential to shift around in the helmet, creating an annoyance and potential disturbance for you as the driver. With these two options laid out, you have to decide for yourself whether you want to risk losing the freestanding speakers, or whether you’re willing to deal with that possibility to have the convenience of a new set of bluetooth speakers that you can use at home, on the lawn, or in your car. If you already own a set of bluetooth speakers, you are probably better off with the built-in speaker, with will provide you with peace of mind that you always know where your speakers are! The vast majority of the speakers are outfitted with microphones as well if you are interested in making phone calls with your speaker. Because the user will be speeding down the road while using the microphone, most of them have noice cancelling capabilities to take out the sound of the wind so that the person on the other end doesn’t burst an eardrum. 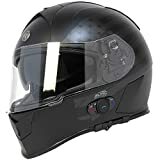 In addition to being able to sync with you telephone and make calls, these type of speakers also allow you to be able to speak with other riders with similar helmets, which can be a big plus. Once you’ve made the big decision of what type of speaker you want to buy, there are a few other things you should think about before pulling the trigger on a purchase. It’s important to make sure that if you buy the freestanding speakers, they will fit inside you helmet because a set of speakers that is too big will make the helmet uncomfortable to wear. If your head ranges on the larger side, it might be a good idea to limit your search to smaller sized speakers. On the other hand, if your helmet is too big or you often find it slipping around on your head, purchasing a larger set of speakers can help to fill in some of that empty space. Also, because Bluetooth is sometimes a frustrating technology which does not always work the way it should, many of the freestanding speakers come with a cord to attach to the music-playing device in case the Bluetooth technology fails. Make sure that you don’t lose the cord, because although 99% the Bluetooth should work, if it doesn’t, you’re going to be wondering what you did with that cord! If you are planning on shelling out the big bucks for a pair of speakers, it is important to ensure that the sound quality is acceptable. Of course, the best way to do this is by testing them out yourself, but if you are planning on buying the speakers online, you’ll definitely ask any friends that might have the same model, or at the very least, to read some reviews. 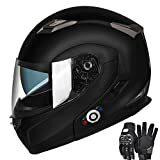 Sites like Amazon and Best Buy that sell bluetooth motorcycle helmet speakers offer plenty of customer reviews for you to get an idea of what you’re going to be purchasing. One of the most important things to think about when you are weighing your options is whether it is comfortable. It’s important to remember that as fun and entertaining as a bluetooth speaker will be, it’s simply an accessory and the most important thing when it comes to driving a motorcycle is simply getting from point A to point B on your motorcycle safely. So be sure that the speaker is comfortable and does not distract from your driving in any way, shape or form. And along the same lines, of course, be sure to set up your playlist and voice dialing before you hit the open road, you don’t want to be switching songs or making any sort of calls while speeding down the highway!